Nintendo Overview: Two worlds collide in an all-new adventure set in the world of Super NES™ classic The Legend of Zelda™: A Link to the Past™. In this newly spun tale, Link™ transforms into a living painting to cross into a dark, parallel dimension mirroring Hyrule. Conquer the puzzles, traps, and hidden rooms of deadly dungeons to save both worlds from certain doom! Brought to life in 3D, this beloved, top-down world is the perfect backdrop for a sweeping new tale. 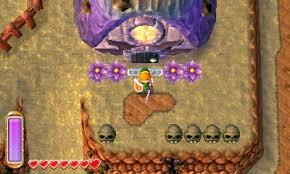 Dungeons sink deep below the screen as Link and his attacks pop out, highlighting the nonstop action. The pace is faster than ever, especially since you can swap items on the Nintendo 3DS touch screen. Shoot an arrow, toss a boomerang, bomb a wall, then merge into a painting to slide between two worlds - all in a matter of seconds. 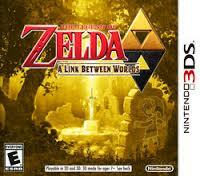 With gameplay, visuals, and controls this smooth and consistent, no Zelda™ adventure has ever been so action-packed. 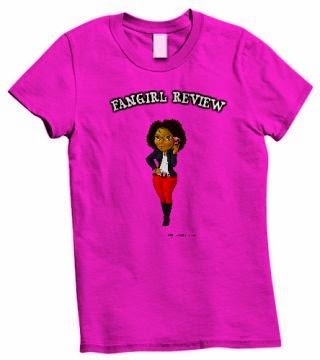 Fangirl Thoughts: I know you think this review is late. I will admit that I did pick up the game on time. I had it on day one it just took me forever to play it because I was too busy playing Fantasy Life. Then despite the fact that I had a lot of work to do I decided to start this action adventure and then I was hooked. 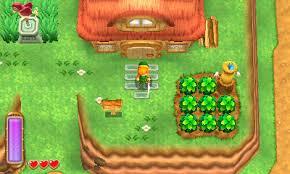 I did not play A Link to the Past but that did not stop me from playing this installment of the series. Rovio is a cool bunny character that you let stay at your house. Then he sets up show and begins to sell weapons. In this game you do not just gain the bombs, boomerang, etc. Instead you rent them from Rovio or buy them a large cost. Story: Link is tasked with saving Zelda and the seven stages with some guidance from Hilda from Lorule. Did you see what they did there? Hyrule has Zelda and Lorule has Hilda. 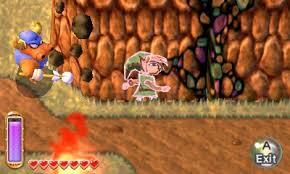 This alternate world is dark and destroyed and mirrors Hyrule. You travel to that world through breaks in the current world. You get a very trippy visual every time you travel between worlds but it is fun nonetheless. There is a great twist at the end and I really enjoyed this story line. Top-Down View: It has been awhile since I played a game that was this type of view but I will admit I did enjoy the change. It did make the fighting easier as you did not have to always worry about targeting. The drawback is that you have to get used to understanding where you are walking especially when walking a thin beam. 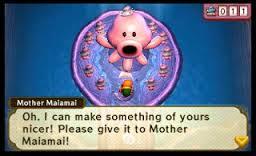 Side quests: My favorite side quest was Mother MaiMai and finding all her adorable children. You had to constantly go between the two worlds to land just right so you could find them stuck on walls or under rocks. If you collected at least ten then your weapons would be upgraded. There were a hundred to collect. Overall this game was enjoyable. I would recommend it to anybody that is a fan of the series. Check it out and let me know what you think.